Keywords: Silver, Nanoparticles, Nanotoxicology, Rainbow trout, Life stage, Blood ... To the end of December 2011, ... different life stages of rainbow trout to. 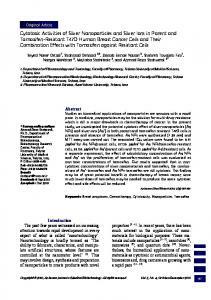 methods for determination of silver nanoparticles inhibition effect as (i) method ... 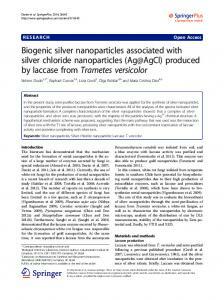 The applied silver nanoparticles also generated oxidative stress revealed by. the chiral interactions between lipase and the herbicide dichlorprop. Chirality ... ral herbicide dichlorprop by copper: roles of reactive oxygen species. Environ. 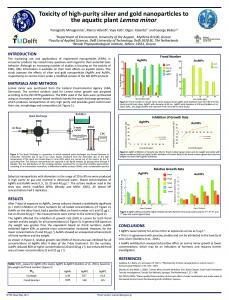 Apr 13, 2014 - duced oxidative DNA damage and repair in the nematode C. ele- gans .... HDD of the AgNPs was between 35 and 108 nm using DLS mea-. Risk Assessment Division, National Institute of Environmental Research, Kyungseo-Dong, Seo-gu, ... ics, Japan) to check the pH-dependent variation in AgNP. Prior to toxicity testing the agglomeration of polyvinylpyrrolidone (PVP) and starch-coated ..... enÃ¤jÃ¤rvi is located in close proximity to human settlements and. Oct 30, 2014 - chemical reduction of silver nitrate in aqueous solutions was employed. ...... Globally Harmonized System of Classification and Labelling of. Oct 19, 2013 - Artemia use in toxicology poses a reasonable number of ... well containing 2 mL of 33 ppt of saline water along with ..... Pediatric Surgery, vol. magnified in aquatic ecosystems. The aim of this study is to show how salinity can decrease the toxic effects of silver nanoparticles on exposed rainbow trout fry. ABSTRACT. Background: In recent years, silver nanoparticles due to their antimicrobial properties, have formed about 56% of nanoparticles global production. 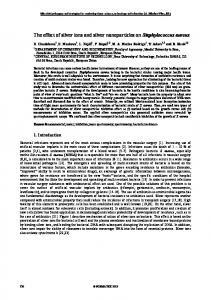 © 2012 Asghari et al; licensee BioMed Central Ltd. This is an Open Access article distributed under the terms of the Creative Commons Attribution License (http://creativecommons.org/licenses/by/2.0), which permits unrestricted use, distribution, and reproduction in any medium, provided the original work is properly cited. agent, size, and shape) may change their effect on living organisms, leading some scientists to suggest that the toxicity of these new materials needs to be investigated case by case. Accordingly, the present study used D. magna as a model aquatic organism to evaluate the short-term toxicity of three different types of well-characterized silver nanoparticles, including two nano-Ag colloids, one of which has already been supplied as a reference material for the OECD WPMN (working party on manufactured nanomaterials) sponsorship programme on the testing of manufactured nanomaterials, and a nano-Ag powder suspended in water by sonication; moreover, an AgNO 3 solution was also used to compare the toxicity effects of silver ions and silver nanoparticles. For each type of material, the mortality and immobilization rates, swimming type, and visible uptake of nanoparticles by Daphnia were investigated and compared. nanoparticle were statistically compared using a MannWhitney rank sum test. In the nAg1 colloid observed by TEM, the particles were spherical in shape (Figure 1A), with a maximum diameter of 15.83 nm; 36.06% of the particles had diameters between 7 and 9 nm (Figure 2A); and the CMD (count median diameter) for the particles was 7.32 nm (Figure 3A). Also, the geometric mean diameter (GMD) and geometric standard deviation (GSD) of the colloidal silver nanoparticles were 7.96 nm and 1.35, respectively. In the case of the nAg2 colloid observed by TEM, the particles were spherical in shape (Figure 1B), with a maximum diameter of 129 nm: 65.14% of the particles had diameters between 1 and 13 nm (Figure 2B), just 2.28% of the particles had diameters more than 100 nm, and the CMD for the particles was 6.47 nm (Figure 3B). Also, the geometric mean diameter (GMD) and geometric standard deviation (GSD) of the colloidal silver nanoparticles were 12.65 nm and 1.46, respectively. In the case of the dry powder of nAg3 observed by TEM, the particles were spherical in shape (Figure 1C), with a maximum diameter of 161 nm: 85.97% of the particles had diameters between 1 and 45 nm (Figure 2C), just 1.34% of the particles had diameters more than 100 nm, and the CMD for the particles was 17.97 nm (Figure 3C). Also, the GMD and GSD of the dry powdered silver nanoparticles were 14.39 nm and 1.31, respectively. In the case of the nAg3 suspension, despite extensive sonication, the TEM images showed that in an aqueous environment about 52.9% of the nanoparticles were clumped together and formed large aggregates (Figure 1D). About 70.31% of the aggregates had diameters from 25 to 100 nm, while most of the others had diameters from 100 to about 250 nm. The particle size distributions of the three types of silver nanoparticle were statistically compared using a Mann-Whitney rank sum test. Statistically significant differences were found among the particle size distributions (P < 0.001, nAg1 vs. nAg2; P < 0.001, nAg1 vs. nAg3; P < 0.001, nAg2 vs. nAg3). Thus, while the CMDs for nAg1 and nAg2 were similar, the distributions were different. Figure 1 TEM micrographs of different nanoparticles: (A) nAg1 colloid, (B) nAg2 colloid, (C) dry powder of nAg3, and (D) suspension of nAg3. Figure 2 Size distribution of particles based on number frequency determined from transmission electron microscope data in: (A) nAg1 colloid, (B) nAg2 colloid, (C) and dry powder of nAg3. Figure 3 Size distribution of particles based on cumulative frequency determined from transmission electron microscope data in: (A) nAg1 colloid, (B) nAg2 colloid, (C) and dry powder of nAg3. Statistically significant differences were found among particle size distributions (P < 0.001, nAg1 vs nAg2; P < 0.001, nAg1 vs nAg3; P < 0.001, nAg2 vs nAg3). confidence limits are shown in Table 2. The median effective concentrations of nAg1, nAg2, nAg3, and AgNO 3 were calculated as 0.004, 0.002, 0.187, and 0.0023 mg/L, respectively. Figure 6 Photograph comparing appearance of aqueous stocks of nanoparticles (400 mg/L) used for toxicity tests. A: nAg1 colloid; B: nAg2 colloid; C: suspensions of nAg3 before (left) and after (right) 24 hours. Figure 4 EDX spectrometer patterns of nAg2 and nAg3; (Ni signals in EDX spectrometer are from TEM grid). Figure 5 UV-VIS absorption spectra for colloids of nAg1 and nAg2, nAg3 suspension, and AgNO3 solution. abnormal Daphnia in order of frequency were BOT and SUR; and no ERR was observed in these groups. In the case of the nAg3 treatments, about 26.3 to 31% of the live Daphnia exhibited abnormal swimming, yet the percentage of abnormalities did not differ significantly between the different concentrations (P > 0.05). In the lowest concentration (0.1 mg/L), most of the abnormal Daphnia were ERR, yet in the higher concentrations (0.125 mg/L and more), the abnormal Daphnia were BOT and SUR, respectively. In the AgNO3 treatments, the percentage of abnormalities was dose dependent, and differed from 6.6% in the lowest concentration (0.001) up to 100% in the highest concentrations. Also, most of the abnormal Daphnia were BOT and SUR; and no ERR was observed in these groups. explanation is that, in the case of nano powders that are subsequently suspended (as with nAg3 in the present study), despite the application of sonication, most of the particles tend to form aggregates and make large clumps in aqueous media, thereby decreasing the surface area to volume ratio and reducing the toxicity compared to the ready-for-use AgNP solutions. One exception to this is the study by Park and Choi , who showed that the lethal concentration of suspended powder AgNPs for Daphnia was about 0.001 to 0.002 mg/L, however, their study used a long sonication time (13 hours), followed by stirring for seven days and filtering through a 100 nm membrane; thus, a possible explanation for their high toxicity result was the dissolution of the silver ions into the aqueous media during the 7 days of stirring. In this regard, Kittler et al. showed that the toxicity of AgNPs to human mesenchymal stem cells increased during storage due to the release of silver ions into the stock suspension. The EC50 of the nAg2 colloid was determined to be 0.002 mg/L, which matched the results of Kennedy et al. , who reported that the EC50 of a 31 nm nano-Ag colloid (ASAP®) was 0.0018 mg/L. Meanwhile, the EC50 of the nAg1 colloid was determined to be 0.004 mg/L, so this colloid was two times less toxic than the nAg2 colloid. Even though the particle sizes of the nAg1 and nAg2 colloids were relatively similar (most particles were under 20 nm), the size distribution was significantly different. Thus, it is likely that other distinct characteristics of these two nano-Ag colloids were also related to the different toxicities, along with the particle size difference. For example, different coating agents may have led to the different toxicities. In this regard, Kennedy et al. showed that the toxicities of various AgNPs with different coating agents (Citrate, EDTA, and Polyvinylpyrrolidone) were different (EC50 ranges were 0.0054-0.097 mg/L). Similarly, Zhao and Wang  showed that the EC50s of AgNPs with lactate, polyvinylpyrrolidone, and sodium dodecylbenzene sulfonate coatings were 0.0287, 0.002, and 0.0011 mg/L, respectively, for seven-day old D. magna. Also, Allen et al. Figure 7 Light microscope images of daphnia exposed to nAg1 and nAg2 colloids for 24 hours. A: control; B: live daphnia exposed to 0.002 mg/L nAg1, pigmentation can been seen under the brood chamber (circles); C: dead daphnia exposed to 0.01 mg/L nAg2; D: live daphnia exposed to 0.004 mg/L nAg1; E: live daphnia exposed to 0.002 mg/L nAg2. In images C, D, and E, small bubbles can be seen under the carapace; plus, nanoparticle aggregates can be seen on the antennae, body surface, and also in the brood chamber. Figure 8 D. magna after 24-hour exposure to 0.15 mg/L aqueous suspension of nAg3. A: black color of digestive tract shows uptake of nAg3. B and C: nanoparticle aggregates are attached to antennae and also seen in brood chamber. to the water surface or the bottom. In nAg1, the most common effect was ERR, while in nAg2, the Daphnia were mostly on the bottom or near the surface; so it seemed that nAg2 had a more severe effect on the Daphnia than nAg1. In the case of nAg3, which was more effective than nAg1 and nAg2 at higher concentrations, BOT was the most common abnormal behavior. In this regard, Strigul et al. showed that Daphnia exposed to TiO2 nanoparticles were significantly slower after 24 h than the control Daphnia. Conclusion This study investigated the acute toxicity of three types of silver nanoparticles and AgNO3 in Daphnia magna. The experimental results revealed that the different types of nanoparticles and silver ions produced distinct dose-dependent mortalities. In particular, the toxicity of the nano silver powder dispersed by sonication was lower than that of the colloidal silver nanoparticles. Therefore, the results suggested that the toxic responses were related more to the chemical characteristics and aggregation of the different nanoparticles. 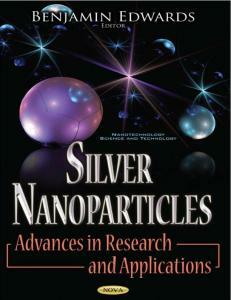 Future studies will investigate the chronic toxicity of different silver nanoparticles using D. magna. Acknowledgements This research was supported by Nanomaterial Technology Development Program (Green Nano Technology Development Program) through the National Research Foundation of Korea (NRF) funded by the Ministry of Education, Science and Technology (No. 2011-0020090). Author details 1 Young Researchers Club, Science and Research Branch, Islamic Azad University, Tehran, Iran. 2Institute of Nanoproduct Safety Research, Hoseo University, Asan, Korea. 3Institute of Nanoproduct Safety Research, Hoseo University, 165 Sechul-ri, Baebang-myun, Asan 336-795, Korea. Authors’ contributions SA, SAJ, JHL, YSK, YBJ, HJC and MCM performed all necessary experiments, SA, SAJ, JHL and IJY analyzed data and wrote manuscript. All authors read and approved the final manuscript. Competing interests The authors declare that they have no competing interests. Received: 31 December 2011 Accepted: 2 April 2012 Published: 2 April 2012 References 1. Woodrow Wilson Database, 2011. Nanotechnology consumer product inventory [http://www.nanotechproject.org/inventories/consumer/ analysis_draft/]. 2. Jovanovic’ B, Anastasova L, Rowe EW, Zhang Y, Clapp AR, Palic D: Effects of nanosized titanium dioxide on innate immune system of fathead minnow (Pimephales promelas Rafinesque, 1820). Ecotoxicol Environ Saf 2011, 74(7):675-683. 3. Cho KH, Park JE, Osaka T, Park SG: The study of antimicrobial activity and preservative effects of nanosilver ingredient. Electrochemical Acta 2005, 51:956-960. 4. Mohan YM, Lee K, Premkumar T, Geckeler KE: Hydrogel networks as nanoreactors: A novel approach to silver nanoparticles for antibacterial applications. Polymer 2007, 48:158-164. 5. Shahverdi A, Fakhimi A, Shahverdi HR, Minaian S: Synthesis and effect of silver Nanoparticles on the antibacterial activity of different antibiotics against Staphylococcus aureus and Escherichia coli. Nanomedicine: Nanotechnology Biology and Medicine 2007, 3:168-171. 6. Zheng J, Wu X, Wang M, Ran D, Xu W, Yang J: Study on the interaction between silver nanoparticles and nucleic acids in the presence of cetyltrimethylammonium bromide and its analytical application. Talanta 2008, 74:526-532. 7. Blaser SA, Scheringer M, Macleod M, Hungerbühler K: Estimation of cumulative aquatic exposure and risk due to silver: Contribution of nano-functionalized plastics and textiles. Sci Total Environ 2008, 390:396-409. 8. Farkas J, Peter H, Christian P, Gallego Urrea JA, Hassellöv M, Tuoriniemi J, Gustafsson S, Olsson E, Hylland K, Thomas KV: Characterization of the effluent from a nanosilver producing washing machine. Environ Int 2011, 37(6):1057-1062. 9. 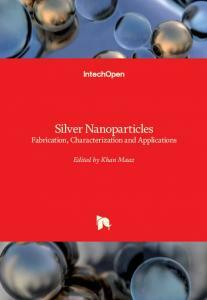 Kaegi R, Sinnet B, Zuleeg S, Hagendorfer H, Mueller E, Vonbank R, Boller M, Burkhardt M: Release of silver nanoparticles from outdoor facades. Environ Pollut 2010, 158(9):2900-2905. 10. Reijnders L: The release of TiO2 and SiO2 nanoparticles from nanocomposites. Polym Degradation Stab 2009, 94:873-876. 11. Baun A, Hartmann NB, Grieger K, Kusk KO: Ecotoxicity of engineered nanoparticles to aquatic invertebrates: a brief review and recommendations for future toxicity testing. 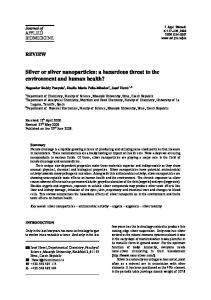 Ecotoxicology 2008, 17:387-395. 12. OECD Guidelines for the Testing of Chemicals: Daphnia sp., acute Immobilization Test Paris, France: Organization for Economic Cooperation and Development; 2004, Test No. 202. 13. Allen HJ, Impellitteri CA, Macke DA, Heckman JL, Poynton HC, Lazorchak JM, Govindaswamy S, Roose DL, Nadagouda MM: Effects from filtration, capping agents, and presence/absence of food on the toxicity of silver nanoparticles to Daphnia magna. Environ Toxicol Chem 2010, 29(12):2742-2750. 14. Gaiser BK, Biswas A, Rosenkranz P, Jepson MA, Lead JR, Stone V, Tylerd CR, Fernandes TF: Effects of silver and cerium dioxide micro- and nano-sized particles on Daphnia magna. J Environ Monit 2011, 13:1227-1235. 15. Griffitt RJ, Luo J, Ao J, Bonzongo JC, Barber DS: Effects of particle composition and species on toxicity of metallic nanomaterials in aquatic organisms. Environ Toxicol Chem 2008, 27(9):1972-1978. 16. Kennedy A, Hull M, Bednar AJ, Goss J, Gunter J, Bouldin J, Vikesland P, Steevens J: Fractionating Nanosilver: Importance for Determining Toxicity to Aquatic Test Organisms. Environ Sci Technol 2010, 44:9571-9577. 17. Glover CN, Wood CM: Accumulation and elimination of silver in Daphnia magna and the effect of natural organic matter. Aquat Toxicol 2005, 73:406-417. 18. OECD Guidelines for the Testing of Chemicals: Daphnia magna Reproduction Test Paris, France: Organization for Economic Cooperation and Development; 2008, Test No. 211. 19. Bhui DK, Bar H, Sarkar P, Sahoo GP, De SP, Misra A: Synthesis and UV-vis spectroscopic study of silver nanoparticles in aqueous SDS solution. J Mol Liq 2009, 145:33-37. 20. Kong H, Jang J: One-step fabrication of silver nanoparticle embedded polymer nanofibers by radical-mediated dispersion polymerization. Chem Commun 2006, 28:3010-3012. 21. Petit C, Lixon P, Pileni MP: In-situ synthesis of silver nanocluster in AOT reverse micelles. J Phys Chem 1993, 97:12974-12983. 22. Henglein A: Physicochemical properties of small metal particles in solution: microelectrode reactions, chemisorption, composite metal particles, and the atom-to-metal transition. J Phys Chem 1993, 97:5457-5471. 23. Sastry M, Mayya KS, Bandyopadhyay K: pH-dependent changes in the optical properties of carboxylic acid derivatized silver colloidal particles. Colloid Surf A 1997, 127:221-228. 24. AshaRani PV, Low Kah Mun G, Hande MP, Valiyaveettil S: Cytotoxicity and genotoxicity of silver nanoparticles in human cells. ACS Nano 2008, 3:279-290. 25. AshaRani PV, Mun GLK, Hande MP, Valiyaveettil S: Cytotoxicity and genotoxicity of silver nanoparticles in human cells. ACS Nano 2009, 3:279-290. 26. Carlson C, Hussain SM, Schrand AM, Braydich-Stolle LK, Hess KL, Jones RL, Schlager JJ: Unique cellular interaction of silver nanoparticles: sizedependent generation of reactive oxygen species. J Phys Chem B 2008, 112:13608-13619. 27. Choi O, Hu ZQ: Size dependent and reactive oxygen species related nanosilver toxicity to nitrifying bacteria. Environ Sci Technol 2008, 42:4583-4588. 28. Liu J, Hurt RH: Ion release kinetics and particle persistence in aqueous nano-silver colloids. Environ Sci Technol 2010, 44:2169-2175. 29. Park SY, Choi J: Geno- and Ecotoxicity Evaluation of Silver Nanoparticles in Freshwater Crustacean Daphnia magna. Environ Eng Res 2010, 15(1):23-27. 30. Kittler S, Greulich C, Diendorf J, Koller M, Epple M: Toxicity of silver nanoparticles increases during storage because of slow dissolution under release of silver ions. Chem Mater 2010, 22:4548-4554. 31. 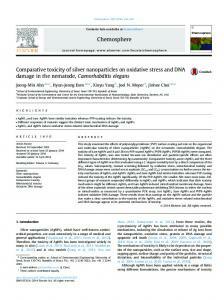 Zhao CM, Wang WX: Importance of surface coatings and soluble silver in silver nanoparticles toxicity to Daphnia magna. Nanotoxicology 2011, doi:10.3109/17435390.2011.579632. 32. Erickson RJ, Brooke LT, Kahl MD, Venter FV, Harting SL, Merkee TP, Spehar RL: Effects of laboratory test conditions on the toxicity of silver to aquatic organisms. Environ Toxicol Chem 1998, 17:572-578. 33. Lemke AE: Interlaboratory comparison acute testing set Springfield, VA: National Technical Information Service; 1981, EPA 600/3-81-005 or PB81160772. 34. Wood CM, La-Point TW, Armstrong DE, Birge WJ, Brauner CJ, Brix KV, Call DJ, Crecelius EA, Davies PH, Gorsuch JW, Hogstrand C, Mahony JD, McGeer JC, O’Connor TP: Silver in the environment: transport, fate, and effects.Edited by: Andren AW, Bober TW. Pensacola, Florida: SETAC; 2002:25-63. 35. Bianchini A, Bowles K, Brauer CJ, Gorsuch JW, Kramer JR, Wood CM: Evaluation of the effect of reactive sulfide on the acute toxicity of silver (I) to Daphnia magna. Part II: Toxicity results. Environ Toxicol Chem 2002, 21:1294-1300. 36. Nebeker A, McAuliffe C, Mshar R, Stevens D: Toxicity of silver to steelhead and rainbow trout, fathead minnows and Daphnia. Environ Toxicol Chem 1983, 2:95-104. 37. Ratte HT: Bioaccumulation and toxicity of Ag compounds: A review. Environ Toxicol Chem 1999, 18:89-108. 38. UN (United Nations): GHS (Globally harmonized system of classification and labelling of chemicals). New York and Geneva 2009. 39. EC: Regulation (EC) No 1272/2008 of the European Parliament and Council of 16 December 2008 on classification, labeling and packging of substances and mixtures. Official Journal of the European Union 2008. 40. EC: Annex VI of Directive 1999/45/EC to consolidated version of directive 67/548/EEC. General classification and labeling requirements for dangerous substances and preparations 1999. 41. Baun A, Sørensen SN, Rasmussen RF, Hartmann NB, Koch CB: Toxicity and bioaccumulation of xenobiotic organic compounds in the presence of aqueous suspensions of aggregates of nano-C60. Aquat Toxicol 2008, 86:379-387. 42. Dabrunz A, Duester L, Prasse C, Seitz F, Rosenfeldt R, Schilde C, Schaumann GE, Schulz R: Biological Surface Coating and Molting Inhibition as Mechanisms of TiO2 Nanoparticle Toxicity in Daphnia magna. PLoS ONE 2011, 6(5):e20112, doi:doi:10.1371/journal.pone.0020112. 43. Edgington AJ, Roberts AP, Taylor LM, Alloy MM, Reppert J, Rao AM, Mao J, Klaine SJ: The influence of natural organic matter on the toxicity of multiwalled carbon nanotubes. Environ Toxicol Chem 2010, 29(11):2511-2518. 44. Heinlaan M, Kahru A, Kasemets K, Arbeille B, Prensier G, Dubourguier HC: Changes in the Daphnia magna midgut upon ingestion of copper oxide nanoparticles: A transmission electron microscopy study. Water Res 2011, 45:179-190. 45. Kim KT, Klaine SJ, Cho J, Kim SH, Kim SD: Oxidative stress responses of Daphnia magna exposed to TiO2 nanoparticles according to size fraction. Sci Total Environ 2010, 408:2268-2272. 46. Lovern SB, Owen HA, Klaper R: Electron microscopy of gol nanoparticle intake in the gut of Daphnia magna. Nanotoxicology 2008, 2(1):43-48. 47. Roberts AP, Mount AS, Seda B, Souther J, Qiao R, Lin S, Ke PC, Rao AM, Klaine SJ: In vivo biomodification of lipid-coated carbon nanotubes by Daphnia magna. Environ Sci Technol 2007, 41(8):3025-3029. 48. Rosenkranz P, Chaudhry Q, Stone V, Fernandes TF: A comparison of nanoparticle and fine particle uptake by Daphnia magna. Environ Toxicol Chem 2009, 28(10):2142-2149. 49. Zhu X, Zhu L, Chen Y, Tian S: Acute toxicities of six manufactured nanomaterial suspensions to Daphnia magna. J Nanopart Res 2009, 11:67-75. 50. Zhu X, Chang Y, Chen Y: Toxicity and bioaccumulation of TiO2 nanoparticle aggregates in Daphnia magna. Chemosphere 2010, 78:209-215. 51. Strigul N, Vaccari L, Galdun C, Wazne M, Liu X, Christodoulatos C, Jasinkiewicz K: Acute toxicity of boron, titanium dioxide, and aluminum nanoparticles to Daphnia magna and Vibrio fischeri. Desalination 2009, 248:771-782. doi:10.1186/1477-3155-10-14 Cite this article as: Asghari et al. : Toxicity of various silver nanoparticles compared to silver ions in Daphnia magna. Journal of Nanobiotechnology 2012 10:14. 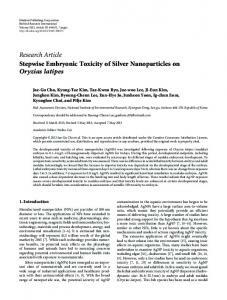 Report "Toxicity of various silver nanoparticles compared to silver ions in ..."